The Health Museum, also known as the John P. McGovern Museum of Health & Medical Science, is an extraordinary attraction that stands out in a city that’s known for its fantastic museums. Since opening its doors in 1996, The Health Museum has dazzled the eyes and blown the minds of the more than 2.5 million visitors it has welcomed. With its ever-changing collection of amazing exhibits, it’s set to do so for many years to come. To say the museum is immersive and interactive is putting it mildly. Consider the permanent exhibits of the Amazing Body Gallery. Inside, you can stroll under a 22-foot-long backbone with floor-to-ceiling ribs, watch a 12-foot heart go into cardiac arrest, explore the 40-foot-long “Colossal Colon,” and inspect the inside of a giant, walk-in eyeball. You can also play memory games inside a 10-foot brain, look down a throat and see vocal chords in action, or try to stump the computers at one of 30 interactive kiosks. Over at the unique “You: The Exhibit,” you might finally be able to answer that profound question, “Who am I?” Designed to elicit the awe and wonder audiences felt at the 1939 World’s Fair, the exhibit is a learning environment that will help introduce you to the who, what, where, when, and how of you. Through special effects technology you’ll be able to see your internal organs in real time at the Body Scanner, and get a glimpse of what you’ll look like in 30 years at the Age-O-Matic. You can even visualize yourself as the opposite gender and ethnicity at the Feature Change Global View. As you move between stations and input anonymous information about yourself, your stats will be added to the exhibit’s database, causing the demographics to slowly change with each visitor who participates. To experience being a medical scientist for a day, you and the kids (older than seven) will want to head to the DeBakey Cell Lab, a 2,000-square-foot exhibit where you can participate in seven authentic cellular biology experiments. Don a lab coat, gloves, and goggles and perform cheek cell analysis, extract DNA, determine mystery microbes, and more with a computerized Lab Companion as your step-by-step guide. The software plays in both English and Spanish, making DeBakey the only bilingual science lab museum exhibit in the country. In addition to playing movies at the 4D McGovern Theater - the first theater in the city to incorporate special effects like rain, lightning, and scents into 3D film screenings - the museum rotates in temporary and seasonal exhibits that cover a wide range of interesting topics. Another big draw is the museum’s spring break and summer Discovery Camps, where kids five to 13 years old enjoy a week of fun, age-appropriate learning activities, doing everything from diving into the life of a forensics expert to building a robot. They are some of the most popular summer camps in Houston, so don’t wait too long to register. 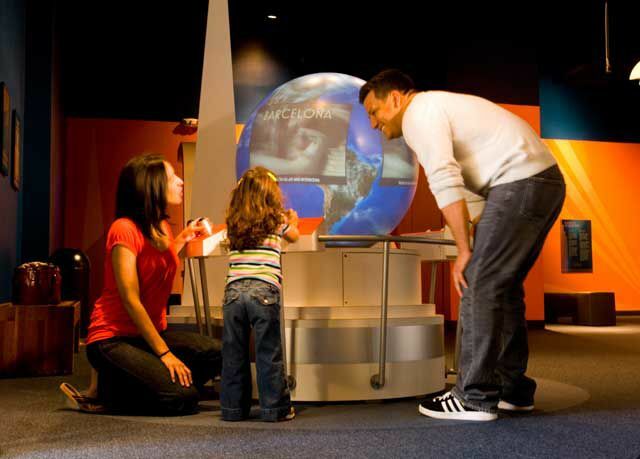 The Health Museum interactive exhibits delight, entertain, and educate visitors of all ages. If you’re looking for something fun to do with your kids in Houston, find your way to The Health Museum.